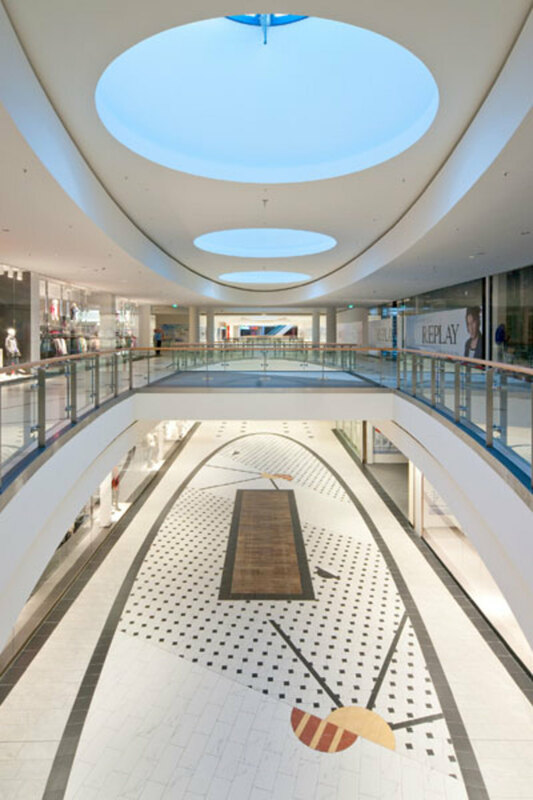 Dresden’s ElbePark, one of the busiest shopping centres in the capital city of Saxony, the epitome of a successful blend of shopping and entertainment, has been subjected to an effective redevelopment and renewal project with a particular emphasis on surfaces and floors. Dresden’s ElbePark, one of the busiest shopping centres in the capital city of Saxony, the epitome of a successful blend of shopping and entertainment, has been subjected to an effective redevelopment and renewal project with a particular emphasis on surfaces and floors. FMG and Ariostea created designs and rosettes for the floor to underline entrances and passageways and mark routes in the shopping centre. The flooring in the shopping centre is framed by a big elliptical design defined by a continuous black line and decorated with alternating dark tiles (Ariostea Nero Marquinia Extra high tech marble with a deep black background and veins of varying intensity, Verde Brasil, a light green material with large patches in a stronger shade of green) and lighter-coloured FMG Natural Stones (pre-polished Kashmir White, with irregular veins in different hues of grey and reddish flecks against a greyish white background, pre-polished Imperial White in different shades of grey to black and pre-polished Statuario Venato in sandy beige with lighter veins in a darker hue of beige), while Ariostea high-tech woods, compact slabs of solid porcelain stoneware in Rovere Chiaro, Rovere Biondo and Rovere Moka, further emphasise the central areas – as if to emphasise their structure – the passageways to the escalators linking the various levels in the shopping centre and, on the top floor, the presence of various different shops. Ariostea high tech woods faithfully reproduce the appearance, tactile sensations and veins of natural wood and require no treatment before or after laying or in the years that follow.